1. From left – The new AJA President, Ashraf Dali, Kim Hak Joon, former Chairman of DongA Ilbo, Catherine the representative of Joko, Jasmine Lee, Lee Joon-ik , and Lee-Sang Kee the former President of AJA at the award ceremony at the National Assembly Hall, Seoul, Korea 2016. SEOUL 16 April – The President of Indonesia, Joko Widodo won the Asia Journalist Association ( AJA) Award 2016 in the political category for his effort in transforming the Indonesians’ economy and gradually eradicating corrupt practices amongst government officials and bureaucracy. The second winner was the famous Korean film director, Lee-Joon-ik, who produced the film “The Portrait of a Poet”, based on the poet of Yoon Dong-ju which was against the Japanese colonization . Lee was selected for the high humanitarian values he injected in the film. The first foreign Congressmen of Korea, Jasmine Lee from the Philippines won the social category for her contribution to Korea multi-cultures . 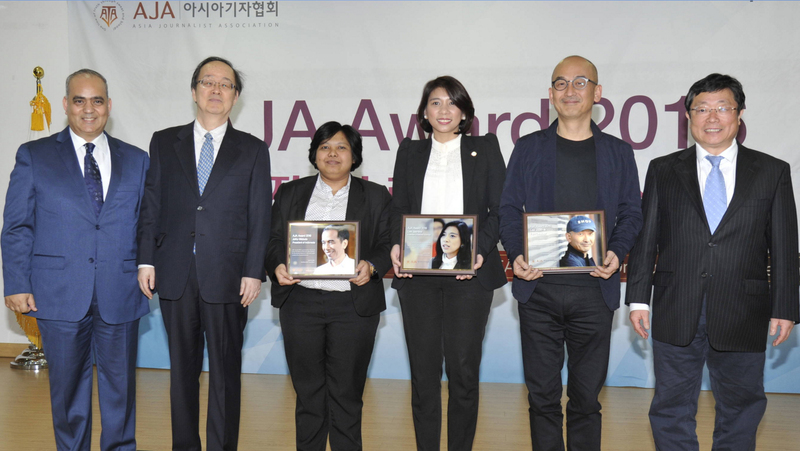 ” She showed great achievement dealing with minority issues and diverse culture in Korean society,” said AJA.